Summary and Definition: The Kansa tribe of farmers and hunters lived along the Kansas River, a tributary of the Missouri and extended from Kansas into Nebraska. They were a strong, proud, war-like people who fought with other tribes, the fur traders and white soldiers and settlers before signing a number of treaties which culminated in their forced removal to reservations. The above picture depicts Meach-o-shín-gaw, meaning Little White Bear, who was a distinguished Kansa brave. It was painted by the famous artist George Catlin (1796-1872) at Fort Leavenworth in 1832. The proud young warrior wore striking vermillion red face paint and wore a highly ornate headband with a roach headdress. His finest jewelry was worn including numerous bead and shell necklaces together various ear piercings and earrings. The most decorative earring piece was made using long, cylindrical 'Hair Pipe' beads strung with smaller beads that extended to his chest as a necklace. What was the lifestyle and culture of the Kansa tribe? The name "Kaw" or "Kansa" means, "People of the South Wind," and the state of Kansas takes its name from this famous tribe. The Kansa people were closely related to the Omaha, Osage, Quapah and Ponca tribes. Where did the Kansa tribe live? The Kansa (Kaw) are people of the Great Plains Native American cultural group. The geography of the region in which they lived dictated the lifestyle and culture of the Kansa tribe. What did the Kansa tribe live in? The Kansa tribe lived in villages of thatched longhouses, farming in the close area. The hunted for buffalo on the Great Plains during the summer when they lived in the temporary shelters provided by tepees. What language did the Kansa tribe speak? The Kansa tribe spoke in the Dhegihan dialect of the Siouan language, closely related linguistically to the Sioux and the Stoney tribe. What food did the Kansa tribe eat? What weapons did the Kansa use? The weapons used by the Kansa tribe included bows and arrows, stone ball clubs, hatchet axes, spears, lances and knives. Painted war shields were used on horseback as a means of defence. What clothes did the Kansa tribe wear? 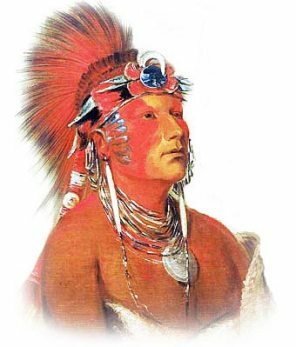 The men of the tribe wore a variety of clothes including a red or blue breechcloth with a belt, and deerskin leggings, and sometimes a blanket robe over the upper part of the body, often trimmed with fur. Buffalo hides were also worn as cloaks and moccasins were worn during the winter. The men of the Kansa tribe wore Roach headdresses that were attached to a scalp-lock on their shaved heads and stood straight up from the head like a tuft or crest. Ornaments were made of beads, shells and metal. The 'Hair Pipe' beads were long, slim, hollow, cylindrical beads that were used as hair decorations, chokers and the famous breastplates that were worn by many of the tribes of the Great Plains. The women wore buckskin knee-length dresses or skirts, leggings and blanket cloaks. What was the religion and beliefs of the Kansa tribe? The religion and beliefs of the Kansa tribe was based on their belief in the Great Spirit and Animism that encompassed the spiritual or religious idea that the universe and all natural objects animals, plants, trees, rivers, rocks, mountains etc. The Kansa religion involved vision quests and many different spirit beings, or wakan, who held different powers. Kansa History: What happened to the Kansa tribe? The following Kansa history timeline details facts, dates and famous landmarks of the people. The Kansa timeline explains what happened to the people of their tribe.